"This is a slap in the face to all Bostonians," says Brian Lang, president of Unite Here Local 26. By Spencer Buell·	 10/4/2018, 5:24 p.m.
As Boston hotel cleaners, cooks, servers, and other employees chanted and marched their way through day two of their historic strike on Thursday, they spotted some infamous guests walking through their picket line at the Ritz-Carlton: The New York Yankees. 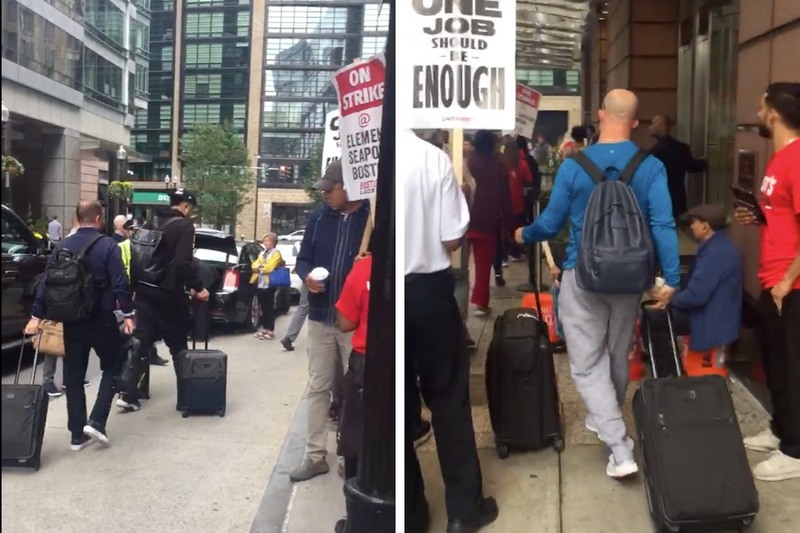 Workers at seven of the city’s Marriott-run hotels who are calling for more stable schedules, a living wage, and more on-the-j0b protections, have been on strike since Wednesday morning. They spent Thursday appearing outside the entrances to the hotels chanting “Don’t check in! Check out!” and urging potential guests to stay elsewhere until the hotel company meets their demands. Players did not appear to have any trouble getting inside the hotel. In one of several videos shared with Boston, someone can be heard saying, “Let him through,” as a player snakes his way through the crowd. The Yankees did not immediately respond to a request for comment. The union also represents workers at Fenway Park, who are not on strike. Marriott International has said it is “disappointed” with the union’s decision to strike and has said its hotels will remain open even while workers have walked off the job.